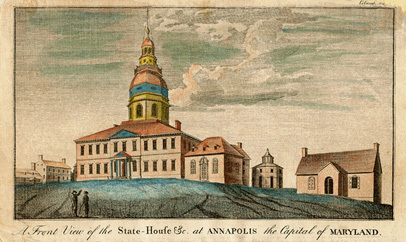 The Maryland State House soon after its completion, by Charles Willson Peale. Published in Columbian Magazine, 1789. America's First Peacetime Capitol and the oldest state house still in legislative use. Completed in 1779, it was the site of nationally important events during the American Revolution, including George Washington's resignation as commander in chief of the Continental Army from the army, and the ratfication of the Treaty of Paris. The rich architecture and history of the building was recognized in 1960 when the State House was designated as a National Historic Landmark. The Maryland General Assembly convenes in the Maryland State House for three months each year. The governor, lieutenant governor, speaker of the House of Delegates and president of the Senate all have their offices in the historic building. The State House is administered by the State House Trust which oversees the interpretation of the building as well as its care and maintenance. The Trust also has responsibility for the use of the public areas of the State House. The Office of Interpretation is a program of the Maryland State Archives. Specialized curatorial tours of the building and its artwork can be arranged by appointment by calling 410.260.6445. There is no charge for tours, but donations are encouraged to support the interpretation of the building. Please note that security measures are in place for all state buildings in the Annapolis complex. Picture IDs are required for entrance and metal detectors are in operation. For school groups, adults need photo ID but students do not. Backpacks and other bags will be searched.